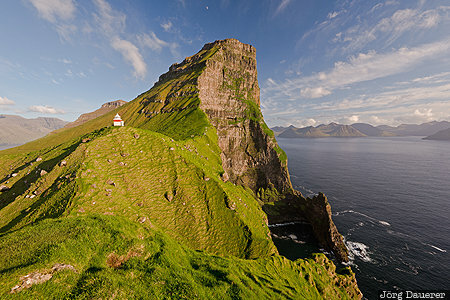 The lonely Kallur lighthouse at the northern tip of Kalsoy surrounded by the steep green rocks of the Faroe Islands. The island Kalsoy is part of the Northern Islands, Faroe Islands. This photo was taken in the evening of a sunny day in June of 2017. This photo is in the Photo Calendar "Färöer Inseln". This photo was taken with a digital camera.